As a quick recap since it’s been a minute, what I mean by ‘living in the grey’ is to accept the nuances and complexities of the world, without reacting with hostility anytime something impinges on your worldview. 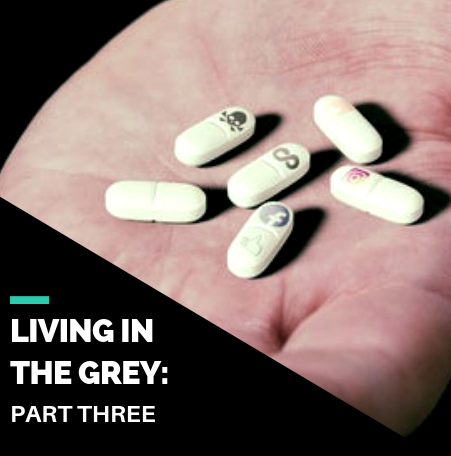 In this series, we are particularly talking about the consequences of our general failure to live in the grey, on our ability to communicate with one another. When discussing the disruptive, aggressive, unproductive place that we’ve gotten to in communication as a society, there’s really no discussion without diving into the topic of social media. As a completely unprecedented way of bringing people together, social media, with its mantra of connecting the world, has achieved this goal, but not with the intended results. Sure, there have been major successes, such as 2011’s Arab Spring movement, but these positives are overshadowed several fold by things like Russian bot scandals, Facebook’s role in the ethnic cleansing of the Rohingya people of Myanmar, and the often horrific tone and content of the dreaded comments section. Social media is as black/white of a space as we have in our society, so diagnosing why this is, through looking at three of the primary issues with social media, can teach us a lot about how we’ve gotten to this place. Critical thinking is as key of a skill as we have for communication in a society as complex as ours, yet it is lacking on large scales on social media. We need to understand diverse viewpoints and deep topics, which is why opinions distributed to the masses have been previously left up to experts, who would think through a situation before responding. The immediacy of social media, and the need to always be first and fast with comments, means that critical thinking is quickly swept aside by our emotional reactions. People are putting their feet in their mouths at an unbelievable rate, because of a lack of critical thinking, and this is only exacerbating our communication problems. One of the other main issues with communication on social media is how easily it allows people to shirk responsibility for the things that they say to others. Whether through anonymous profiles, or by a sheer refusal to take account for the humanity of the other people involved, many social media users feel free to unleash on others in ways they never would in person, because they don’t expect the consequences that come with this behaviour. This lack of personal responsibility also manifests in the online issue of sharing articles based on headlines. Many media companies and publishers use blatantly outrageous headlines to increase the sharing of their articles, and this leads to people forming opinions that aren’t aligned with facts, or even worse, are aligned with outright lies or conspiracies. This proliferation of misinformation has made people suspicious, incredulous, and hateful towards those who disagree with them. This final issue brings together the prior two, and compounds them through the massive reach of social media platforms, and the ability for just about anyone to garner an audience, regardless of their credibility. Gone are the days when a comment could be dismissed as ‘only a Facebook post,’ or ‘just a tweet,’ because we’ve seen the devastation that these communications can bring. People’s lives are being altered and ruined by social media everyday, and at the heart of this is the black/white, us/them, left/right communication that this series hopes to diagnose and cure. Social media has gone from a Utopian tool aimed at bringing the world together, to an echo chamber generator, filled with hate, misinformation, and emotional reactions. Without critical thinking, personal responsibility, and an appreciation of the power of social media, these trends will only get worse, and become more damaging. On a personal level, implementing these solutions, and discussing them with those in your social sphere, can go a long way to fixing the bad habits we’ve developed online, and help us all ‘live in the grey.’ While this won’t always be easy, making a concerted effort to get a little better each day will lead to extensive changes in the long term! For the next piece in this series, we’ll take a look at how generational differences have played a role in dividing us through communication, especially in the workplace.